“Just who do you think you are?” sneers an all too familiar voice. “Who do you think you are to live your dream? to share your knowledge on a subject legitimated by your education, publications and talents? to be true to yourself? to say no to someone other than your children?” We recognize the questions because they hit us regularly like unmerciful waves. And the voice? Well, it too is unmistakable because it is internal. It is our own. Women have the tragic tendency to sabotage themselves, says author Janet Davis. Consequently women, their families and communities and even the world at large are poorly served. 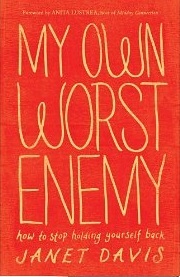 In her third book, My Own Worst Enemy: How to Stop Holding Yourself Back (Minneapolis, MN: Bethany House, 2012) Davis speaks of, to and about women standing in their own way. The reader hears the author’s and other women’s voices in addition to those of women in the Bible, as their stories are shared. With each speaker one journeys through the pain of personal sabotage; wades through the ebbs and flows of emotional and spiritual growth; and experiences the sweetness inherent in hard-won victories of wholeness. Through these anecdotes alone Davis encourages the reader. (Call it the misery-loves-company, or better yet the you’re-not-alone effect.) However, she does not stop there. Each chapter begins with sidebars of thoughts to consider; and concludes with a series of thought-provoking questions in a section Davis entitles “Your Story.” Both are meant to move the reader beyond spectating and consuming towards engaging and (ideally) embracing herself. Heart, mind and soul may participate, whether in individual study and prayer or amongst a small group. The strength of the book emanates from Davis’ consummately spiritual core. Those familiar with spiritual direction will be at home within her contemplative writing style and her constant search for God (and God’s activity) in all circumstances. All have the opportunity to have Davis as a faithful sojourn partner of integrity and authenticity. Indeed, she does not ask of the reader anything that she has not experienced herself, and she shares rather boldly to boot. As earnestly feminine as this book is, I feel an opportunity was missed in exploring the very aspect of the feminine soul that it addresses. Why do (some? most?) women sabotage themselves? Is the cause soul deep? Is this malaise part of females’ curse from the Fall? Is it environmental, proceeding from our family-of-origin? Is it a conglomeration of these and legion other factors? Admittedly, I have not read Davis’ first book, The Feminine Soul: Surprising Ways the Bible Speaks to Women (Colorado Springs, CO: NavPress, 2006). It could be that Davis covered this topic in that book. Even so, other readers may be Janet Davis novices like myself. She mentions the feminine soul once within the book (on p. 48). My appetite was at once whetted and my soul yearned to be fed with food particular to her palate. Sadly, neither were satisfied. On the whole I found this book to be incarnational. Davis exhibits the very vulnerability, creativity, maturity and courage she hopes for her audience. She trusted her own God-given inner authority and spiritual gifts for her methodology. In offering herself thus Davis provides a living example of a woman shining for the glory of God, self-sabotage shedded. This is the Lord’s doing, and it is marvelous in our eyes (Ps 118:23). If she is “incarnational” then I have to think that she has de-emphasized the Word of God to be happy with a collective experience and community service. She has avoided this conflict by degrading the true Gospel and other non-adaptive scriptures to be politically correct hence, denying the cross and salvation. After our short chat at church this morning, I now see that you understand the word “incarnational” to be negative, or overly self-serving and self-interested. I can certainly follow your line of thought. Here I meant to convey another use of the term, that being that the author embodies her own words. (Perhaps “embodies” might communicate better.) There is no “do as I say, not as I do” going on with Davis in this book. She lives out all that she is encouraging her readers to do by simply writing the book, I feel — even more so by boldly sharing her own story of growing past her own self-sabotaging. Thank you for reading and engaging. Again, I am so grateful to have you in my life. A friend who is passionate about the Word of God is indeed a gift from God! Thanks! I wouldn’t have blamed you for not checking in for a while there becasue I wasn’t posting. Boring, indeed! I guess I’ve been inspired again. Grateful for the Festival of Faith & Writing for that!